SUPERIOR STRENGTH Compared to Anything Else on the Market! Will Not Crimp or Distort Pipes! 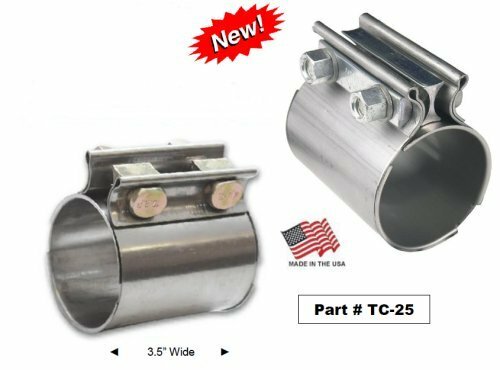 Manufactured out of heavy gauge 1-1/4” wide band (.071” / 15-Gauge bright 430 Stainless), the AccuSeal band clamp is ideal for connecting mufflers & pipes together - when you intend to disassemble later on. Conventional exhaust U-Clamp assemblies put a crimp into muffler necks & pipes, making disassembly impossible without destroying components. These are the band clamps you have been looking for! (AccuSeal Clamps are widely used on OE exhaust assemblies). Super high quality grade-8 hardened hardware is included – clamps come assembled as shown. Make clean-looking, smooth connections with superior strength. AND, you can slide components apart when needed later on. Perfect for at-the-track component removal or switching. *NOTE: It is ABSOLUTELY recommended that you cut 4 slots into the ID connection (the outside pipe) to allow for pipe contraction upon tightening. You can easily do this with a conventional cutoff wheel. Cut slots approx. 1.5” in length, & at 12, 3, 6, & 9 O-Clock positions. Note: Minimum quantity purchase of 4 clamps. We can also supply large quantities! AccuSeal is a product of Torca Products, Inc.
* Made of beefy 3/32" thick 409 Non-Bright Stainless Steel. This clamp is all function. * Hardened Grade-8 clear zinc-plated hardware included - clamps are fully assembled as shown. * Torque to 35 foot-pounds. * easy disassembly of exhaust pipes later-on. * Approx. 40% stronger rotation resistance than AccuSeal Clamps when properly installed. * Approx. 55% stronger separation resistance than AccuSeal Clamps when properly installed. * Available in 2-1/2" & 3" sizes. * Available for aftermarket only through Classic Chambered Exhaust at this time. Torca Products are premium quality & made in the USA (Auburn Hills, MI. ), not junk imported knock-offs. We are an authorized distributor for Torca AccuSeal™ & DuraSeal™ exhaust clamps & will only distribute the best.